Panasonic is currently shipping the Smart VIERA TC-L65WT600, which Panasonic claims is the world's first Ultra HD TV with a 4K 60p input designed based on HDMI 2.0 and DisplayPort 1.2a specifications. Offering up to 60 frames per second 4K playback, the WT600 is ready for the next level in home entertainment. 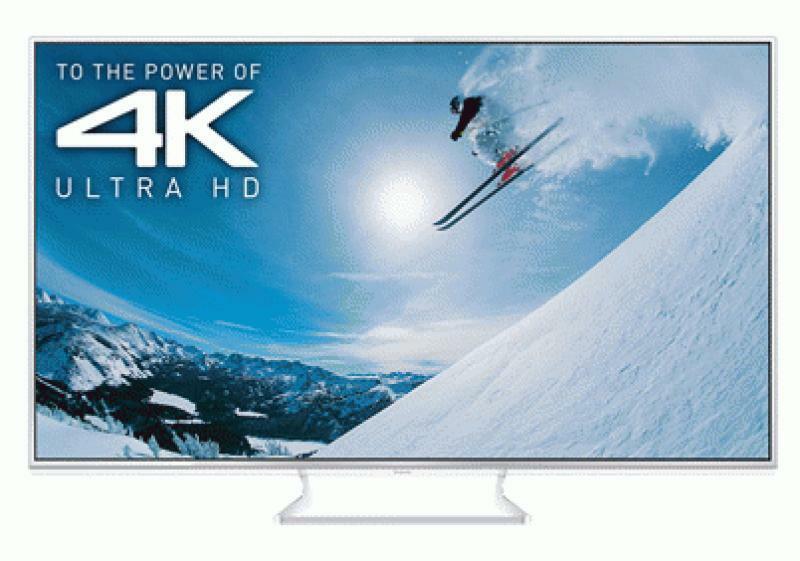 • See reviews of UHD 4K TVs in our HDTV Review section. The WT600 panel's 2,400 Back Light Scanning (BLS) technology reportedly provides high motion sharpness, even in fast action scenes. The TV also features a minimalist design, with a thin metal frame that focuses attention on the image. According to Panasonic, the next generation 4K 60p input, designed based on HDMI 2.0 and Display Port 1.2a specifications, helps assure compatibility with future 4K-players, set-top boxes and next-generation gaming consoles. PC gaming enthusiasts can connect their PC to the WT600 via the 60p-capable DisplayPort. The WT600's built-in HTML5 web browser can also allegedly show Internet pages in 4K. The WT600 has a built-in 4K H.264 (MPEG4) decoder, which not only enables the playback of 4K video files via USB and SD Memory Card, but - even more importantly - enables the playback of 4K content directly from the Internet. Photo enthusiasts can access their photography either via an SD card with the 4K Photo Viewer SD, or use 4K Swipe & Share to wirelessly transfer photos from their mobile phone or tablet in Ultra HD resolution. With 4K Intelligent Frame Creation, the WT600 supposedly achieves smooth panning of up to 120 frames per second, even with Ultra HD sources. Panasonic's 4K Ultra HD TV also analyzes complex scenes - with movement from a variety of directions - and optimizes each object independently. The Local Dimming Pro enhances overall image by improving control of details in both darker and brighter areas. Meanwhile, the new 4K Fine Remaster Engine allegedly maximizes the image quality for content created with resolution lower than 4K. The circuit processing technology produces images with higher definition by interpolating the missing parts of the images and re-producing the non-existent data. The WT600 features an ISFccc Calibration Mode and is compatible with CalMAN calibration software, ensuring precise color neutrality. The Panasonic TV Remote 2 App also offers Smart Calibration, a function which enables the viewer to set correction curves for gamma, white point, and color saturation on the TV via their Android or iOS7 Smartphone or tablet. The WT600 also features the Voice Interaction feature, allowing users to control their TV by speaking into the microphone of the touch pad controller, or into a smartphone or tablet with the installed Panasonic TV Remote 2 App. In addition, the photo-sharing capabilities of Swipe & Share mean that users can share images in 4K-resolution on the WT600's large screen with just a swipe of their finger. As with all Smart VIERA TVs, the WT600 features built-in Wi-Fi as a standard. Users can access multimedia content on their home network via DLNA streaming, as well as the Apps for the Smart VIERA platform with its expanding range of Smart TV applications including popular social networking TV apps such as Facebook, Twitter and Skype. With the WT600's automatic pop-up camera, video calls can be made with the click of a few buttons. The WT600 includes a 4K web browser. For easy text and web address input, users can connect a keyboard to the WT600, using a USB adapter or wirelessly via Bluetooth. The Bluetooth module provides users with additional wireless connectivity options, allowing them to connect compact speakers or headphones. The 65-inch class Panasonic Smart VIERA WT600 Ultra HD TV is available now on shop.panasonic.com and at select retailers.